In the miniature potrait of Catherine of Aragon (NPG 4682), attributed to Lucas Horenbout or Hornebolte, Catherine is wearing a brooch on the front of her gown which appears to be letters. The Holbein portrait of Jane Seymour in the Kunsthistorisches Museum is wearing a similar brooch. I know the Latin inscription on Catherine's portrait is "Queen Catherine,his wife" but what, if anything, do the brooches mean? I'm blanking on the exact meaning, but I think it has something to do with Jesus (with the J being and I in Latin). Maybe the first three letters? I'm sure someone else will know for sure! IHS is a monogram of the name of Jesus Christ. From the third century the names of our Saviour are sometimes shortened, particularly in Christian inscriptions (IH and XP, for Jesus and Christus). In the next century the "sigla" (chi-rho) occurs not only as an abbreviation but also as a symbol. From the beginning, however, in Christian inscriptions the nomina sacra, or names of Jesus Christ, were shortened by contraction, thus IC and XC or IHS and XPS for Iesous Christos. These Greek monograms continued to be used in Latin during the Middle Ages. Eventually the right meaning was lost, and erroneous interpretation of IHS led to the faulty orthography "Jhesus". In Latin the learned abbreviation IHC rarely occurs after the Carlovingian era. The monogram became more popular after the twelfth century when St. Bernard insisted much on devotion to the Holy Name of Jesus, and the fourteenth, when the founder of the Jesuati, Blessed John Colombini (d. 1367), usually wore it on his breast. Towards the close of the Middle Ages IHS became a symbol, quite like the chi-rho in the Constantinian period. Sometimes above the H appears a cross and underneath three nails, while the whole figure is surrounded by rays. IHS became the accepted iconographical characteristic of St. Vincent Ferrer (d. 1419) and of St. Bernardine of Siena (d. 1444). The latter holy missionary, at the end of his sermons, was wont to exhibit this monogram devoutly to his audience, for which some blamed him; he was even called before Martin V. St. Ignatius of Loyola adopted the monogram in his seal as general of the Society of Jesus (1541), and thus it became the emblem of his institute. IHS was sometimes wrongly understood as "Jesus Hominum (or Hierosolymae) Salvator", i.e. Jesus, the Saviour of men (or of Jerusalem=Hierosolyma). phd historian, does IHS have any reference to "in hoc signo" (from the Latin, "in hoc signo vinces/in this sign thou wilt conquer?" For some reason that reference stuck in my mind. Foose, I do not actually know. The Catholic Encyclopedia that Amanda B quotes from is authoritative and always accurate, so certainly that answer is correct. Whether or not some people later derived additional meanings for the abbreviation, I just don't know, though it makes logical sense that they would. In recent discussion about portraits and David Starkey, I pointed out what I believe to be the highly UNreliable use of items of jewelry in a portrait to identify the sitter. The IHS brooches in these two portraits offer a perfect example of why I oppose the technique. In the case of Starkey and the portrait of Katherine Howard, he argues that the jewelry worn by the sitter in the painting matches items described in an inventory of jewels that belonged to Howard. He did the same with the Yale miniature and an inventory of jewels given to Jane Grey in July 1553. And Susan James used the technique in re-identifying the Parr portrait (NPG4451). Now, for the sake of example, imagine that the Katherine of Aragon miniature is not labeled. In such a case, using the jewelry-identity technique, one might very easily suggest that the miniature is of Jane Seymour, since the brooch in the two are almost identical in appearance! And if one allows for the lesser artistic skill of the miniaturist and sets aside what one already knows about the paintings, it is possible to perceive a physical similiarity between the two women. 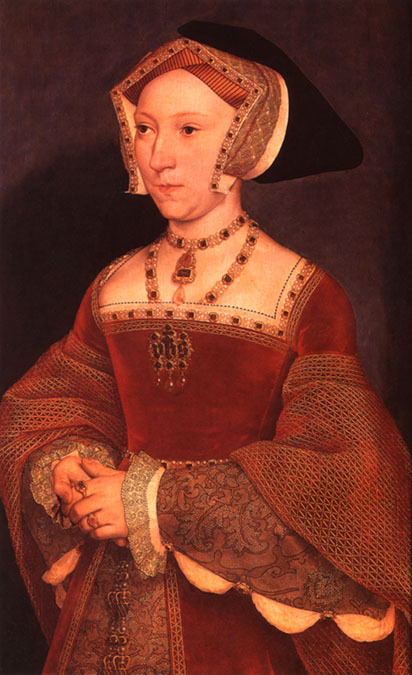 Did Henry give Katherine's brooch to Jane Seymour? Perhaps. The two pieces are remarkably similar. And because jewelry was routinely recycled in this way, I believe it mitigates against using jewelry to identify sitters in portraits. Any jewel inventory of the period offers only the vaguest of descriptions, making it impossible to distinguish between two similar pieces and adding to the UNreliablility of the technique. The IHS brooch might be described as "Item: a brooch in gold, with IHS enameled upon it, with six diamonds and three pendant pearls." (for an authentic jewel inventory of 1553, see http://www.somegreymatter.com/janegreyjewelinventory.htm) Such a description is simply not detailed enough to make it possible to identify exactly which jewel in which portrait is being described. And thus it is all but impossible to draw a definitive link between a jewel in a painting and an inventory and to conclude that the sitter in a portrait must be a specific person. Thanks, Diane, for providing such an excellent example for me to use! Phd Historian, - interesting discussion. What has always confused me about using jewelry to identify a sitter is that it assumes the artist used absolutely no artistic license in painting the adornments. If artists could exaggerate the beauty of a sitter then why wouldn’t they also exaggerate the wealth of their costume? Using the brooch example – Couldn’t you say that Henry didn’t necessarily have to give Katherine’s brooch to Jane for the artist to use it. Couldn’t the artist have simply “borrowed” the jewelry from a previous painting of Catherine? Did artists have this creative license to copy jewelry from previous works? Or was jewelry more a symbol of the state and therefore the jewelry had to be owned by that sitter at the time of the portrait? Using a later example, Vermeer painted several women (some of them seemingly middleclass) adorned with pearl earrings. Most art historians doubt that Vermeer’s subjects were wearing such large and fabulous pearls at the time of their sitting. You raise an intersting point, Bearded Lady. Actually, most portraitists of the period were apparently meticulous in their depiction of both jewels and clothing. "Wealth of costume" was not exaggerated, odd as that may seem to us today. Jewels were not "borrowed" or copied from other paintings, nor was artistic license used. Nor was jewelry a "symbol of the state." The concept of state-owned jewels did not yet exist. that ambition was not usually allowed to evidence itself as "pretending to be something one was not." Formally presenting oneself in a painted portrait as more wealthy and therefore of a higher social status than one actually occupied was frowned upon. And while sumptuary laws were passed to limit the wearing of certain fabrics and items of clothing by people not "entitled" to those things, the sumptuary laws were an effort by the old aristocracy to keep the newly-risen aristocracy in check. It was "old money" vs "new money," not "no money" pretending to be "big money." Think of it as the modern "tasteful" Rockellers, Vanderbilts, Gettys, and Rothschilds reacting to "tacky" new billionaires such as Bill Gates and Richard Branson, and Simon Cowell. Hans Holbein left a large number of sketches done as preparatory drawings for portraits. In those sketches, we can see evidence of his careful attention to the detail of both the jewels and the clothing worn by his subjects. He took notes and wrote out descriptions, in addition to making detailed drawings of all or part of an item. And in the final painting, the attention to extreme detail paid by the artist is clearly evident in every stitch of fabric and every link of gold chain. Compare that to modern painted portraits, where the face receives the majority of artistic attention and the clothing is often left as an impression. One seldom sees in modern portraits evidence of the weave of a fabric or the finest details of a necklace. In their book "Renaissance Clothing and the Materials of Memory," Ann Jones and Peter Stallybrass document that artists often briefly borrowed the items of jewelry and clothing worn by their sitters so that they would have them at hand and be able to depict them more carefully and accurately. Jones and Stallybrass argue convincingly that jewels and clothing were "the" markers of wealth and social status in the Tudor period, and thus in many cases the depiction of those items in a portrait is often even more detailed and accurate than is the rendering of the individual's physical features. This concept applies only to the best of artists, of course ... men and women such as Hans Holbein, Lucas Hornebolt (Hornebout), Hans Eworth (Ewout), Nicholas Hilliard, and Lavina Teerlinc. It would include the unknown artist who painted the portrait that Starkey identifies as Howard. It would not include artists such as the unknown person who painted the "new" portrait of Lady Jane Grey now on display at the National Portrait Gallery, what I call the Streatham Portrait (NPG 6804). Open Thread - Introduce yourselves! Open thread on Starkey's "Virtuous Prince"
Questions from Daniel - Surviving palaces, etc. Question from Ashley - Pronouncing "Henrician"